THE LONG-LIFE ROLLER IS HERE! Reduction of Unscheduled down time: Robust by design to reduce failure rate at site. Engineered for reliability, greater load-bearing capacity, and a longer life span than conventional rollers. Gen 7 is lighter for the longer length roller … where it counts! When an idler roller fails on a critical conveyor causing an unscheduled shut down, the sequence is that not only will that conveyor shut down but also all connecting conveyors need to be sequentially shut down. This can bring to a halt the whole operation. This is critical to mine and port operations as any unscheduled down time can cost real money. Port Conveyors routinely carry up to 10,000.00 tonnes per hour. Example: Production at a mine site – On a conveyor moving 3,600 tonnes per hour, for coal, at $117.000 per tonne, would equate to 1 tonne or $421,200 per hour of lost revenue. Therefore, if a mine loses 2 hours in unscheduled down-time a month, this equates to about $10,108,800 P.A. A well run conveyor enables a mine or port to extend its shut down times from once every 4 weeks to once every 8 – 12 weeks. Where a 24 hour shut-down of a mine, whose conveyors are travelling at 3,600 tonnes per hour, is extended from 4 to 8 weeks this will equate to 120,000 tonnes per shut, saving the mine about $60.7 million per annum. Graph I. This mine has 21,000 rollers on site. 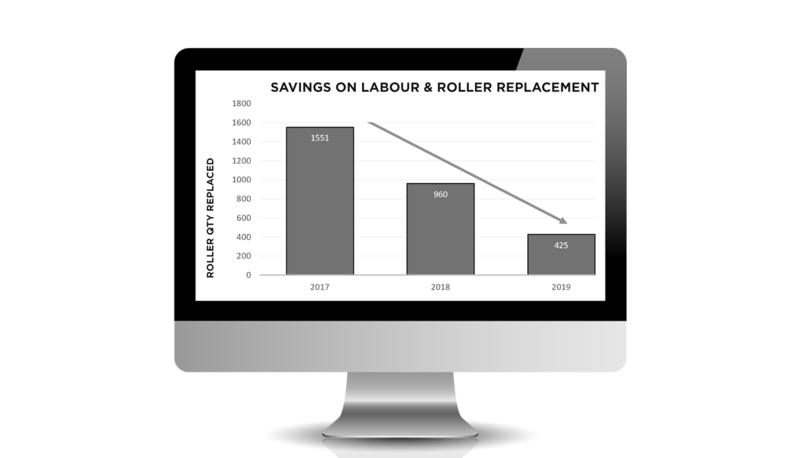 CII supplied large numbers of rollers – the requirement for rollers peaked in July 2018, and has steadily reduced since using CII Rollers. The savings became even more significant over time. In our experience, CII rollers should last for about 3 times that of a conventional roller. If a mine were to change out 2,000 rollers per annum this would equate to about $346,000 plus the cost of the rollers. Case I: At one port where 30 CII Gen 5, idler carbon steel rollers were installed on 17 October 2012, all of these are still running. Case II: A return roller on a ramp conveyor at a mine site, situated just after end pulley – 120 metres from the ground, generally had to be replaced about every 8-10 days. This would result in significant unscheduled down-time. Solution: One CII VitreSteel roller was used as a replacement roller. It was found to be still working after 2 years with significant savings, increased productivity, labour and replacement rollers costs. The weakest link in the chain had been replaced. The savings amounted to millions of dollars. 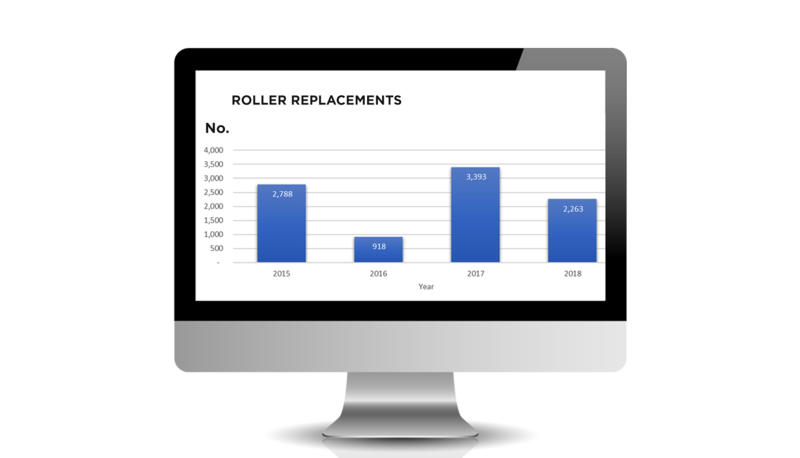 Graph 2019: For the first 5 months the replacement rollers show a continuing downward trend for 4 years. The replacements illustrate the declining purchase of conventional rollers, due to replacement by CII (which have not required replacement to date). The savings are significant.